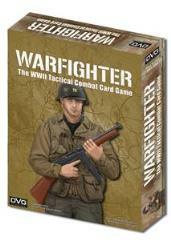 You play cooperatively with your friends against the system to complete WWII combat missions. At the start of each mission, you each select a soldiers, equip them with skills, weapons, and combat gear within the mission's Resource limit. You then fight your way through enemy territory, engaging hostiles, as you attempt to reach and complete your mission objective. Every mission is a stand-alone game. You build your Soldiers, select your Gear, and then run your mission. Within 30 to 60 minutes you will have succeeded or failed. Warfighter uses a new combat system that takes into account the fire mode you select for your weapon, range, running out of ammo, suppression, and cover - all in the same die roll! This system creates an incredibly deep narrative with every attack. As you eliminate hostiles, you gain experience to Upgun your Action cards. The game system controls the enemy soldiers. Warfighter does not require any special rules for solitaire play.